This machine is designed for heavy industrial use and comes with an industry leading 5 year commercial and domestic use warranty. It features a 100% duty cycle at 185amps allowing huge amounts of welding to be performed with no worry of the machine overheating. No other machine is available with this combination of specification, welding ability, warranty and price. A 200 amp MMA inverter - this is a very high quality machine. These machines are extremely high quality whilst giving you fantastic value for money. They are individually inspected, full load and welding tested before dispatch at our UK based Engineering facilities in Loughborough. They feature much higher quality components and design than is the norm and really are a cut above the rest in terms of both quality and performance. As well as this each machine is UK PAT tested during its inspection and is labeled as such - enabling you to put this machine straight to work in your business or workshop. 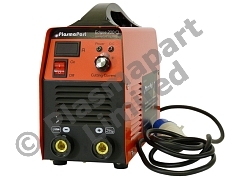 DC inverter welders are completely different to the more usual AC arc welders, they are much more efficient, have vastly improved duty cycles and weld much smoother and easier, as well as striking much easier the arc is more stable and produces a much more uniform weld with deeper more controllable penetration. Heavy duty duty cycle - 100% @ 185 amps and the continuously variable welding current control can be adjusted to give 20A - 200A from the front panel. All of our Eclipse commercial / industrial machines carry a 5 Year UK warranty and in the unlikely event of a problem we arrange and pay for return shipping. It features the latest MOSFET Inverter technology using very high quality Toshiba MOSFETS and is force air cooled.